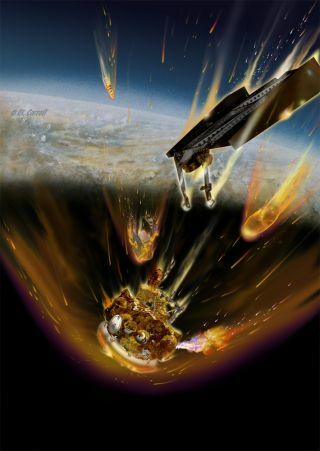 This artist's concept shows fuel from Russia's failed Mars probe Phobos-Grunt burning from a ruptured fuel tank as the spacecraft re-enters the atmosphere. Foul play may be responsible for the failure of Russia's Mars probe Phobos-Grunt, as well as a string of other embarrassing setbacks that plagued the country's space agency last year, the agency's chief suggested. The 14.5-ton Phobos-Grunt spacecraft got stuck in Earth orbit shortly after its Nov. 8 launch, and Russian officials predict it will crash back into the atmosphere this Sunday (Jan. 15). Shadowy unnamed actors may have brought the probe down and caused four other Russian space failures in 2011, hinted Vladimir Popovkin, chief of Russia's Federal Space Agency (Roscosmos). "It is unclear why our setbacks often occur when the vessels are travelling through what for Russia is the 'dark' side of the Earth — in areas where we do not see the craft and do not receive its telemetry readings," Popovkin told Russia's Izvestia newspaper, according to Agence-France Presse. "I do not want to blame anyone, but today there are some very powerful countermeasures that can be used against spacecraft whose use we cannot exclude," he added. "If we did not manage to launch it in the window open in 2011 for a Mars mission, we would have had to simply throw it away, writing off a loss of five billion rubles ($160 million)," said Popovkin, who took charge of Roscosmos in April 2011. Phobos-Grunt was one of five high-profile failures for the Russian space program in 2011. On Feb. 1, a Rockot launch vehicle failed to place an Earth-observing satellite in the proper orbit. A similar problem occurred on Aug. 18, when a Proton rocket delivered a $300 million communications satellite to the wrong orbit. Then, on Aug. 24, the unmanned Progress 44 supply ship crashed while making a cargo run to the International Space Station. Officials identified the cause as a problem in the third-stage engine of the vessel's Soyuz rocket. Russia uses a similar version of the Soyuz to launch astronauts to the space station, so manned flights were put on hold for a stretch this fall until the problem with the rocket was fixed. The end of 2011 included one more failure for the Russian space program. On Dec. 23, an unmanned Soyuz-2 rocket crashed just after liftoff, destroying a military communications satellite. Russia capped the year with a successful launch of another unmanned Soyuz rocket on Dec. 28, a flight that put six new communications satellites into orbit. You can follow SPACE.com senior writer Mike Wall on Twitter: @michaeldwall. Follow SPACE.com for the latest in space science and exploration news on Twitter @Spacedotcomand on Facebook.